Bob Hale. 1934 -2012. Thank you Bob for starting such a wonderful car club for all of us car lovers to enjoy. Members please read our interview with club founder Bob Hale to find out how he got the club started and became known as the Battlefield Region AACA. Question: What made you want to start a car club in Williamson County? Bob Hale: I had gone out to several car shows in the Franklin area and surrounding communities and this sparked my interest. I thought that Franklin could really use a car club. At the time there was Mid- Tenn AACA(Antique Automobile Club of America) and Stones River AACA in Murfreesboro. And I knew from the beginning that I wanted this new club in Franklin to be associated with the AACA. I liked what the AACA stood for in regards to the preservation of antique cars. Question: So how did you get members in the club? Hale: Well I would be out driving around and would spot a classic car and I would make a quick u-turn and follow them to a grocery store parking lot, or back to their homes and ask them if they had any interest in joining a car club. Also there used to be a restoration shop in Franklin on Columbia Ave. The owner knew all of the classic car guys and this helped me get in touch with potential members. At that time I had also gotten in contact with Gene Cross. 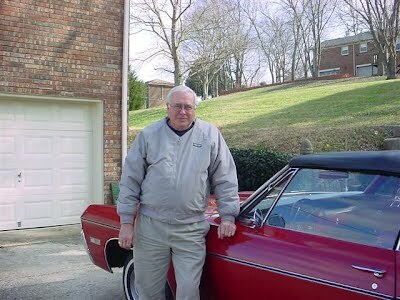 Gene was a developer and a long time Franklin resident and he really knew a lot of people in the car hobby. I also ran some ads in the news paper stating if you would like to join an antique / classic car club call… We held our first meeting on May 3, 1990 at the First Tennessee Bank in Grassland in the banks community room. Question: So who were the founding members? Hale: Larry Arrowood, William Cox, Jr., Gene Cross, William DePriest, William Derryberry, John Egbert, Paul Egbert, Nanette Hale, Robert Hale, Victor Hundt, Richard Jordan, Joseph Ott, George Robeson, Cletus Sickler, George Sickler, Wayne Simmons. Gene Cross was voted in as club president, vice president went to Gerald Robeson, I took the job as secretary, and William Derryberry was the treasurer. Question: What did you want the club to stand for in the car hobby? Hale: We wanted to have the fellowship of a club and at the same time enjoy our cars by displaying them at different events in Franklin.The Franklin Heritage group used to have a historic home tours and they asked our club to place our cars in the driveways of the different historic homes. That was a lot of fun. Question: When you first started the club has that vision stayed the same throughout the years to where it is today? Hale: We have really made great progress in the growth of the club. It really is a great bunch of men and women. My wife and I have made some great friends over the years and continue to enjoy the new members who join. I like that we use our classic cars to get out in the community and lend a helping hand with our car displays. People need to be able to see our classic cars so other people will get interested in the classic car hobby. I think passing the love of classic cars to the next generation of car lovers is an important role the club plays. Question: How did the club putting on a car show come about? Hale: Well after the club was formed someone said lets have a car show. People said there is no way you guys can put on a show in October being a brand new club. Well we some how put the show together and had a nice turn out at Pinkerton Park. Our show is a great one because there are so many different cars that you get to see. It’s amazing to see how many car shows are now in the area. It’s nice to see that our show still draws large numbers and is seen as the premier fall car show in Williamson County. Once again I think having a show is a good thing to help get people involved in the car hobby. Question: What’s something you would like to see the club do in the near future? Hale: I think it would be great if the club could get a club house where we all could meet and enough room to display some of the club cars for everyone to see. I feel this is a worth while goal for the future. Thanks so much Bob for starting such a wonderful club for all of us car nuts to enjoy.